Yes, here it is again, asparagus. I can't resist it. The price is right and the quality is excellent. 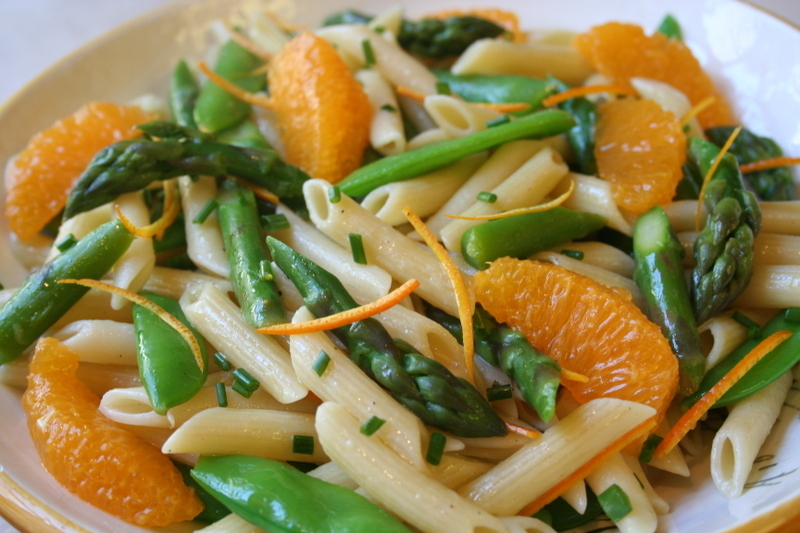 This refreshing salad combines the asparagus with sugar snap peas, penne, and orange segments. Pasta salads can sometimes be a little boring, but I thought this one was quite interesting. And it's perfect for a party, where it could safely sit out at room temperature for an extended period. I long for summer to arrive, with vine ripened tomatoes, basil and peppers. But beautiful spring vegetables, such as these, make the wait bearable. This simple but delicious salad is my submission to Presto Pasta Night, which was started by the wonderful Ruth at Once Upon A Feast. Each Friday Ruth has a recap of wonderful pasta recipes from bloggers from all over the world. So, do stop by and check it out. Bring well salted water to boil and cook the penne according to directions. As it cooks, slice the asparagus into diagonal pieces, about the length of the penne. Clean the sugar snap peas, and remove the zest from the orange and cut it into very thin slivers. Squeeze the juice from the orange and set aside. Cut the other orange into sections. peeled or not. When the pasta is cooked, drain it and run cold water on it. drain off the water and put the pasta in a large bowl. Toss it with 1 Tablespoon of the oil. Set it aside to cool off for at least 1 hour (or longer). As it cools, bring water to boil and cook the asparagus for about 4-5 minutes, then scoop it out and run cool water on it. Then drop the peas in the same water and cook for 2-3 minutes, then drain and run cold water on them. Set the asparagus and peas in the fridge to cool off. 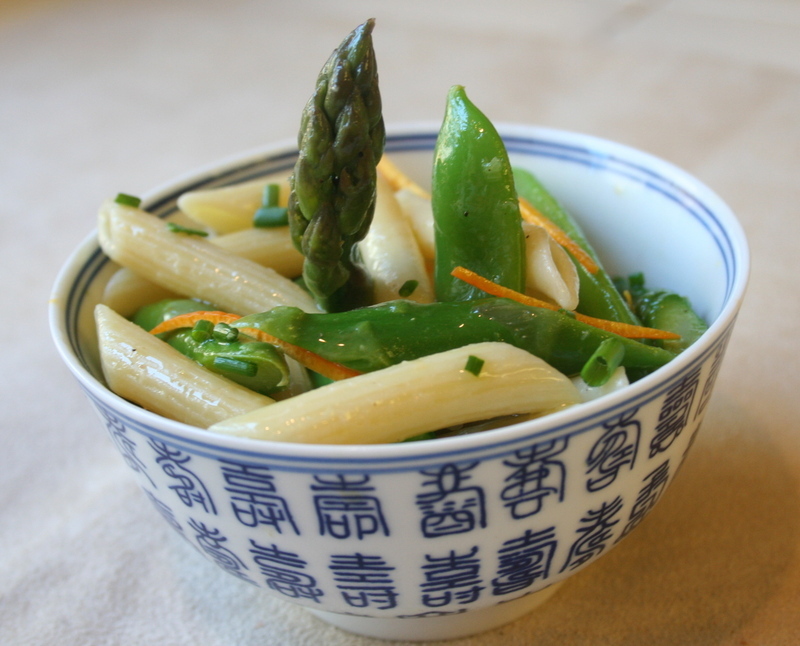 When the pasta has cooled to your liking, mix in the asparagus, sugar snap peas, chives, and dressing. Toss well, and season with salt and pepper if necessary. Serve the salad in individual serving bowls, garnished with the orange segments. Whisk together the remaining 4 Tablespoons of oil, the orange juice, vinegar, zest, and salt and pepper to taste, and add more vinegar or orange juice if you wish. Wow-that looks like spring on a plate. If only the real spring would follow here in the NE. Hope you're doing well, Sher. You've been in my thoughts all week. The colors are lovely, and the combination of asparagus and orange is wonderful. There's an old Julia Child recipe for asparagus with an orange hollandaise -- much heavier, but it reminds me of this one. That's one dish that definitely yells SPRING!!!! Thanks for sharing with Presto Pasta Nights. Now if the weather would just comply! Oh this is a treat for the eyes, and no doubt taste buds. Inspired combo! It looks so springy! so refreshing and simple! This sounds wonderful--lively and fresh and tasting like spring. I've been enjoying the availability of affordable fresh asparagus too lately. oh my goodness that is brilliant! Dear Sher, I hope you are holding up ok this week. I am still purring and meowing in love and kindness in your direction, and my humans want you to know they are too. Meow. That looks so fresh and good. I really like the use of the orange in the pasta!! I love orange segments in salads! This salad is too pretty to eat!